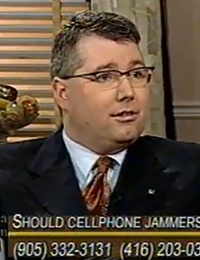 Paul McKeever – Rhonda London LIVE: Should Cellphone Jammers Be Legal? On March 23, 2001, Paul McKeever (Freedom Party of Ontario) was a guest of Rhonda London Live. In this episode, McKeever discussed with host Rhonda London the issue of whether cell phone jammers should be legal, and who decides. Also guests in this episode: Peter Shurman (CEO of Universal Teleresponse Corporation, member of the Canadian Call Management Association) and Carl Olson (Industry Canada). Featuring: Paul McKeever (President, Freedom Party of Ontario), Peter Shurman (CEO of Universal Teleresponse Corporation, member of the Canadian Call Management Association), Carl Olson (Industry Canada). Robert Metz – Rhonda London LIVE: Privacy Protection Robert Metz – Rhonda London LIVE: Does Bill 155 (Asset Confiscation) Go Too Far?